A Ra-Ra Day at Sasha Shangri-La – – Ra-Ra !! 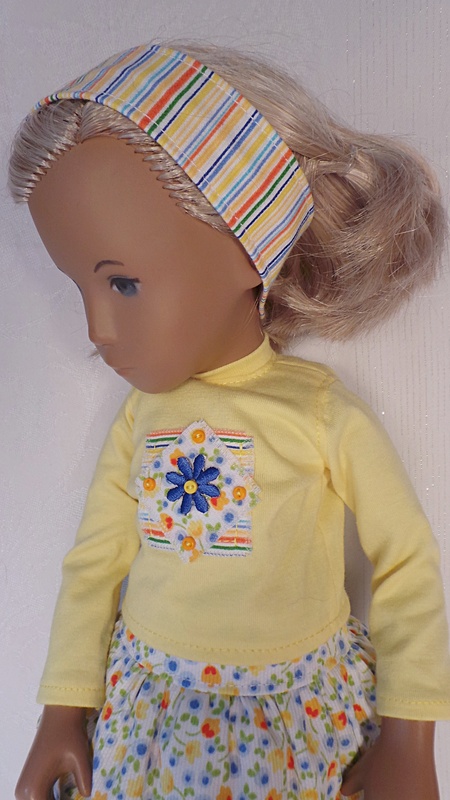 I asked for two outfits and gave Sharon some favorite color and favorite fabric ideas. Then, I asked her if she would make an outfit for Finn. She said yes and I was very happy! :). As you can see, they are fantastic outfits! Here we have Lucy in a cheery yellow outfit, Finn in the middle in his new shirt and shorts, and Kim in a pretty pink outfit. Sharon ran ideas by me during her creative time and I liked that very much. I wanted to take these photos outdoors but it has been rainy just about every day and, when not rainy, it has been extremely hot and humid. I just couldn’t wait any longer so it is time to share these thoughtful and colorful creations. Sharon’s Ra-Ra designs covered them from their heads to their toes. The three pairs of leather shoes are made by Jean Jensen. 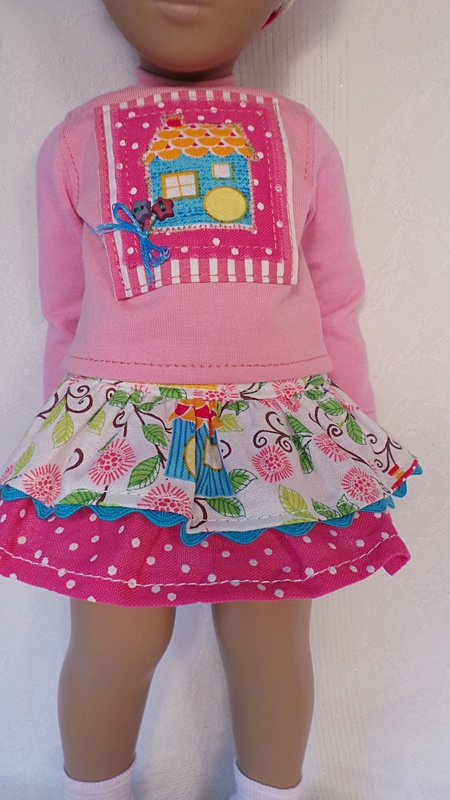 I just love this outfit with the pretty dotted fabric on the headband, top, and skirt. The ricrac trim is a favorite of mine! Her stripy socks are a pale pink and white. 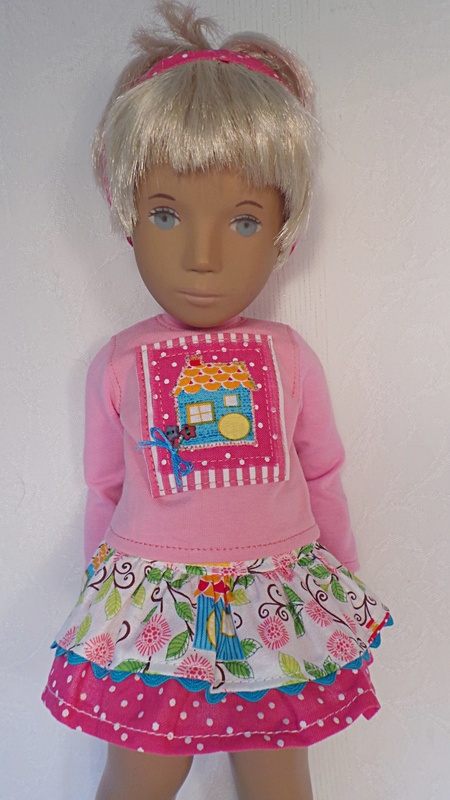 Another view of this super Ra-Ra outfit on sweet Kim. A closer view of the applique and fabrics. 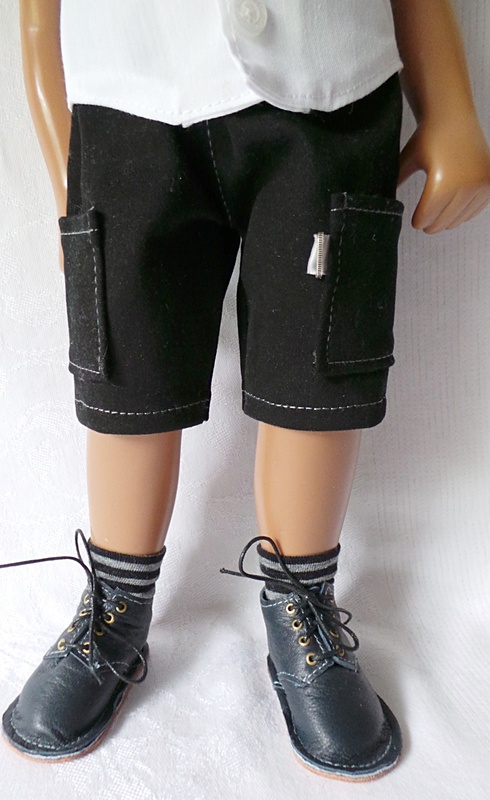 Last, we have Finn wearing his custom outfit by Sharon. It is a great look and Sharon’s signature stripy socks are perfect! Another view of Finn. 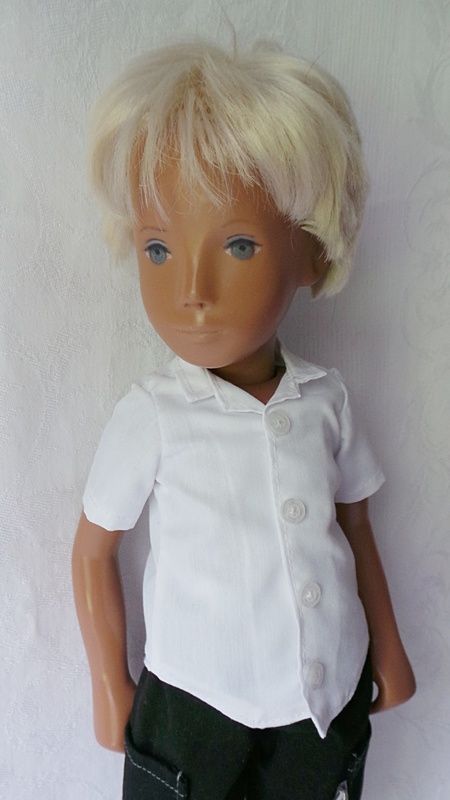 He is a 1967 NP boy with platinum hair. 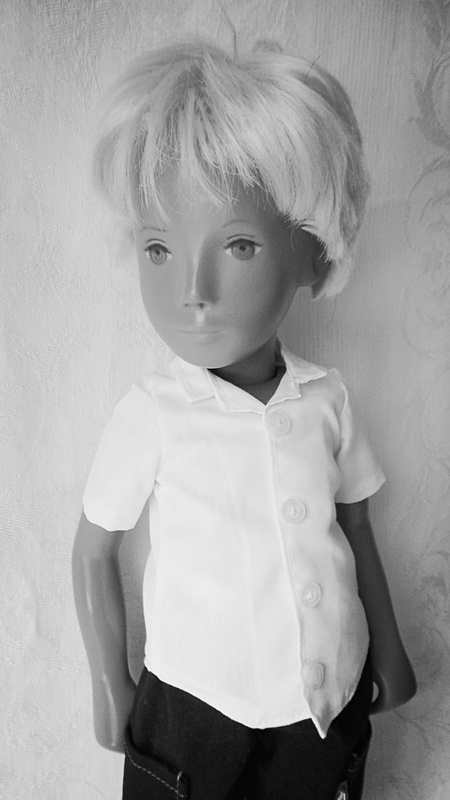 A black and white print of Finn in his black and white outfit. Lucy and Kim together in their Ra-Ra outfits. 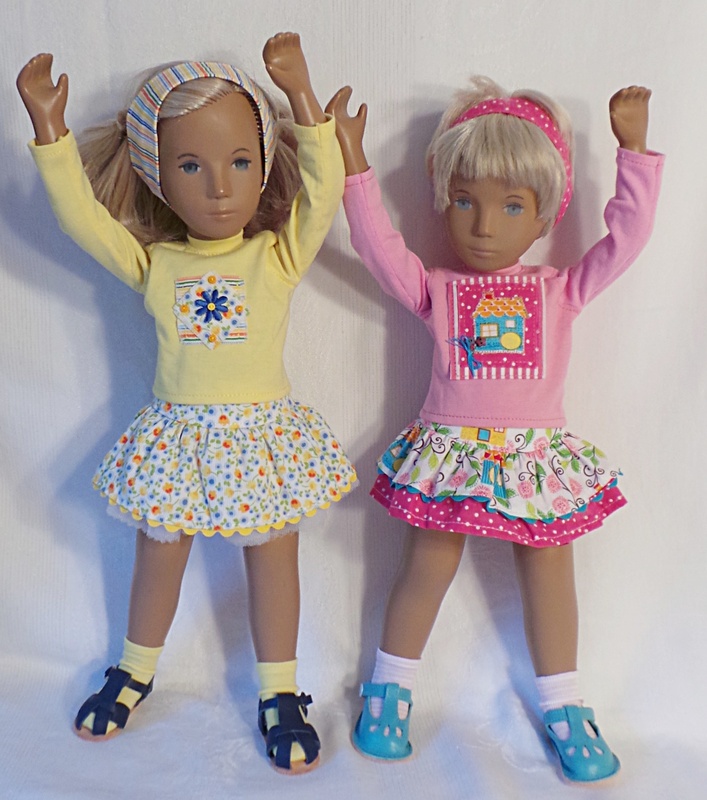 What lovely cheerful outfits – such a great combination of patterns and colour! Awww I’m so pleased that the girls and Finn like their outfits! Such pretty girls and Finn is handsome as ever! I never realised that Lucy started out as a Gregor, she has quite a girly face, she’s lovely! 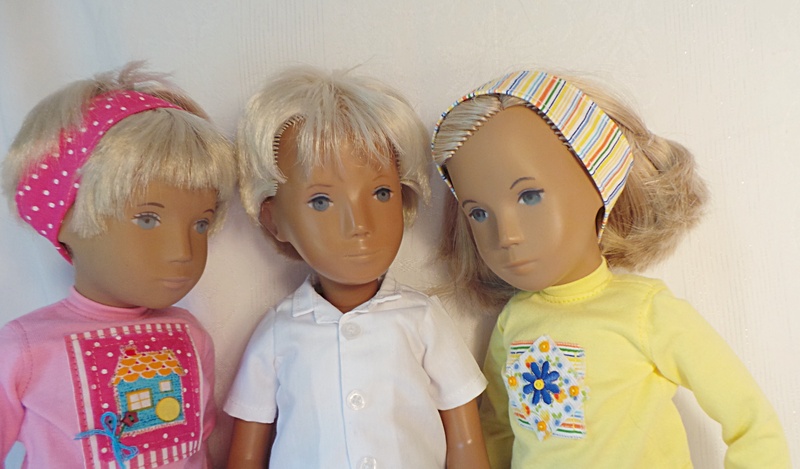 Thanks for the privilige of sewing for your sweet kids Ginger! 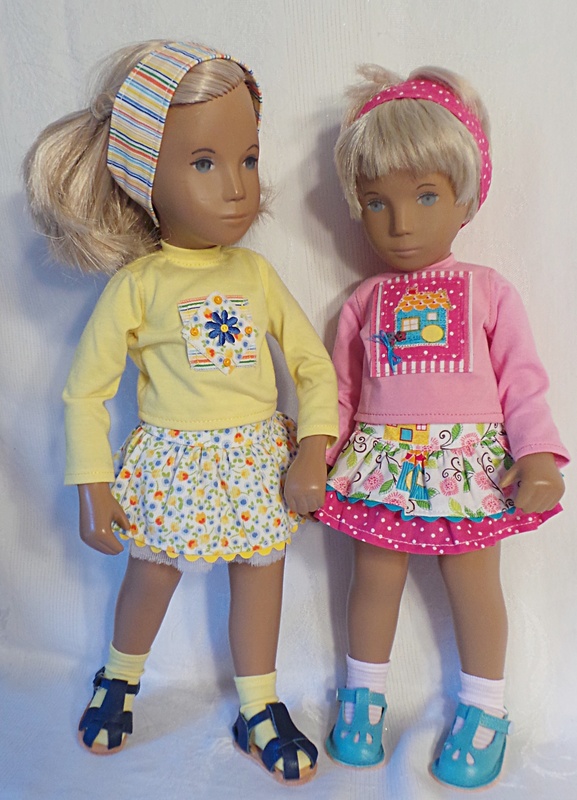 Another two super Ra-Ra outfits from the very talented Sharon Humphreys. 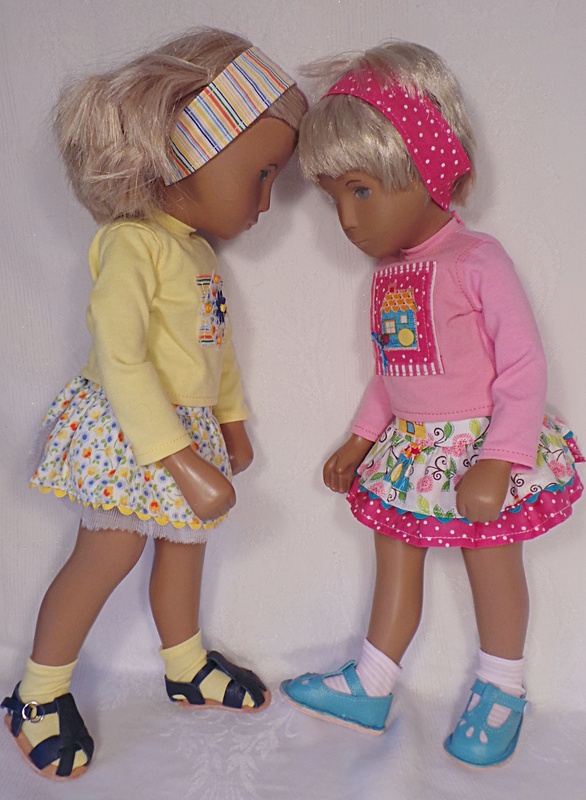 Bright, and cheerful Summer colours really suit these two super fun-loving girls. Sorry Finn, forgot to mention just how smart you look in your new Sharon outfit. Particularly love the black and white photos of you in it. Very smart indeed!